April 10 marks Equal Pay Day, a day that aims to highlight the urgent need to address disparity and gender pay gap. Discrimination and gender inequality still exist globally in the social, political and economic spheres despite national and international measures, conventions and legislation that support gender equality in addition to the role of civil society and women’s rights organizations. The Global Gender Gap Report by the World Economic Forum (WEF) for the year of 2017, found that the gender gap has widened for the first time in a decade, and it will take 217 years to reach economic parity and to close the economic gap between men and women at the current rates of progress. The Global Gender Gap Report by the World Economic Forum (WEF) examines the gap between men and women in four key areas (subindexes): Economic Participation and Opportunity, Educational Attainment, Health and Survival and Political Empowerment. The report benchmarked 144 countries on their progress towards gender parity across the four thematic areas mentioned above. 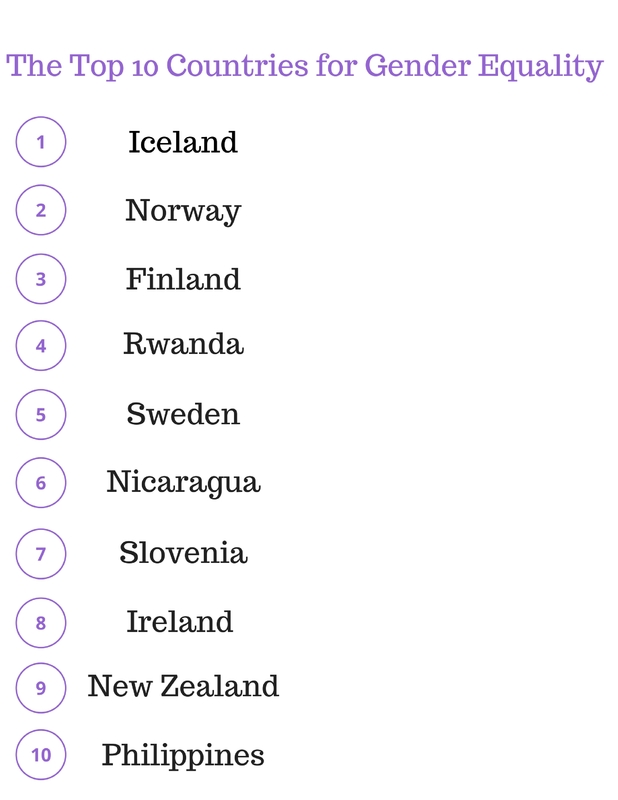 According to the report, the top 10 performing countries are Iceland, the world’s most gender equal country for nine years in a row that closed nearly 88% of its overall gender gap, Norway, Finland, Rwanda, Sweden, Nicaragua, Slovenia, Ireland, New Zealand and the Philippines. The Middle East and North Africa is the lowest-ranked region in the Index with an average remaining gender gap of 40%, according to the report. Tunisia ranked first among the Arab countries and 117th in the world index, followed by the United Arab Emirates 120th, Bahrain 126th, Algeria 127th, Kuwait 129th, Qatar 130th, Mauritania 132th, Egypt 134th, Jordan 135th, Morocco 136th, Lebanon 137th, Saudi Arabia 138th, Syria 142nd, and Yemen 144th. According to the 2017 World Economic Forum’s Global Gender Gap Index Report, Algeria ranked 127th out of 144 countries, falling 7 spots comparing to the previous year, and ranked fourth place among the 14 Arab countries that were measured in the report. On the positive side, Algeria ranked 13 in term of wage equality for similar work and recorded improvements on gender parity in healthy life expectancy. On the economic participation and opportunity sub index, Algeria ranked 132th out of 144 countries. On the education attainment subindex, it ranked 107, on the health survival subindex it ranked 106 while in the political empowerment subindex it ranked 86 out of 144 countries. Egypt ranked 134 globally and 8 among the Arab countries, it moved two spots down on the global ranking from 2016 report. Egypt recorded a notable decline in wage equality for similar work but also an increase in gender parity in tertiary enrolment. It ranked 135 in economic participation and opportunity category, 104 in education attainment, 99 in health survival and 119 in political empowerment. Jordan ranked 135 out of the 144 countries listed in the report, falling one spot comparing to the 2016 report, and took the 9th place amongst the Arab countries. In the measured four areas: economic participation, education, health and survival, and political empowerment, Jordan ranked 138, 51, 113 and 126, respectively. Jordan made a progress in closing the gender gap in labour force participation but the report revealed that Jordan has a widening gender gap on the Political Empowerment subindex. According to the report, Lebanon ranked 137th out of 144 countries and 11th among Arab countries. On the political empowerment sub index, Lebanon has one of the lowest rankings, it ranked 142nd out of 144. In the field of economic participation and opportunity, Lebanon is also way behind, ranking 133rd with a score of 0.44. In terms of education and health, the country ranked 109th in each of these categories with scores of 0.956 and 0.957, respectively. On the positive side, Lebanon recorded an improvement on closing the gender gap in the labor force. Morocco took the 136th place globally and 10th among Arab countries. According to the report, Morocco made a progress in closing the gender gap in economic participation but has a decrease in the political empowerment subindex. The conflict in Syria had a devastating impact on women. Unsurprisingly, Syria was ranked in the global bottom three with a rank of 142 out of 144, which is unchanged from previous years, and has low-performing ranks on the Economic Participation and Opportunity subindex, in particular. Tunisia was one of the region’s best-performing countries along with the United Arab Emirates and Bahrain for the year of 2017, having closed between 65% and 63% of their overall gender gaps. Tunisia recorded an overall rank of 117 and took the first place among Arab countries. The report revealed improved gender parity in ministerial positions, health, and basic literacy. In the measured four areas: economic participation, education, health and survival, and political empowerment, Tunisia ranked 131, 99, 71 and 55, respectively. Despite some advances and efforts aimed at narrowing the gender gap, full equality is not achieved in any country in the world. In too many countries, especially in the Arab region, there is a significant gender gap in economic and political participation, this backlash against women’s rights and their full participation in the economic, political and social life comes as a result to the repressive patriarchal societies, the increased power of conservative trends, militarization, war and occupation, and the lack of political will to move towards gender equality.